Missing from the earlier Christening posts was mention of Samuel’s Godparents – we weren’t really sure what the rules were going to be, and didn’t have our meeting with the minister until a week before the Christening, so had to wait until then to decide what to do. 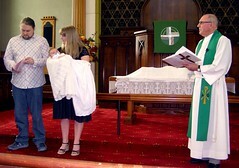 It turned out that since we weren’t having a proper Baptism, but rather a naming ceremony and blessing, there wasn’t a requirement for Godparents. However, we were (are) quite keen on Samuel having Godparents anyway, so decided to have official unofficial (or should that be the other way around?) Godparents anyway. Olyvia’s family is (more-or-less) Methodist, and the ceremony was held in a Methodist church (one with a lot of family connections, and which Olyvia graciously let me veto as the church for our wedding). The tradition, from what we were able to determine, for Methodist Godparents, is to have two of the same gender as the child, and one of the opposite gender (i.e. three in total). Even though they have some crazy ideas (singing the wrong version of Away in a Manger), we liked this idea, but decided to switch it to have two Godmothers and one Godfather (it’s singular in books and film, after all!). So, in the end, Samuel has Jacinta “Jacs” Hawkins and Simon & Jolene Kelly as his Godparents (thanks!). This is just the “take an interest in the upbringing” role, not the guardianship role, which has been taken up elsewhere. Previous Post and so I'm back, from outer space…..